As the Kashmir Highway shutdown order comes into force, a bridegroom in Anantnag had to take written permission from the District Magistrate enable travel of a 12-member marriage party to Doda district in Jammu province. 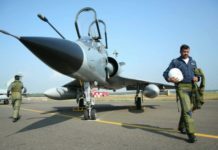 Late on Saturday evening Divisional Commissioner Jammu, Sanjeev Verma, told a press conference that “we should cooperate a little bit to ensure safety of the security forces”. The twice a week Highjway shutdown rule has been enforced to ensure smooth travel of security forces between Baramulla in north Kashmir and Udhampur in Jammu. 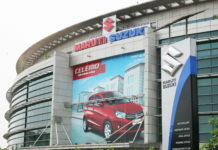 No civilian vehicles are allowed to ply on these days with express permission of the authorities. Coinciding with the day one of Highway gag, a family in Ananantag had obtain written permission of the District Magistrate to travel on the Srinagar-Jammu highway on Sunday, one of the two days in a week when the government has banned civilian traffic. The family, sources said, had to run from pillar to post to seek ‘permission’ for travelling to Doda to their son’s bride’s home. 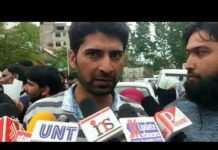 Authorities allowed 12 persons to accompany the groom— Danish Ali— to travel but said the 12-member marriage party would travel in 4 vehicles and will be allowed to move only after “proper frisking and security check-up,” according to an order issued here by the additional deputy commissioner Anantnag, a copy of which lies with GNS. 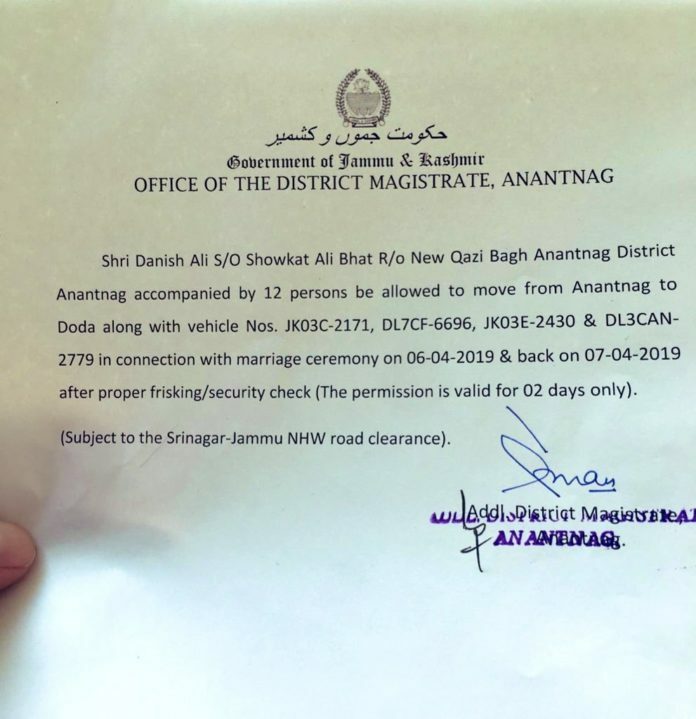 “Danish Ali son of Showkat Ali Bhat of New Qazi Bagh Anantnag accompanied by 12 persons be allowed to move from Anantnag to Doda along with vehicle No’s JK03C-2171, DL7CF-6696, JK03E-2430 and DL3CAN-2779 in connection with marriage ceremony on 06-04-2019 and back on 07-04-2019 after proper frisking /security check (The permission is valid for two days only),” reads an order issued by the additional deputy commissioner Anantnag. The family of Danish Nabi had to abandon preparations for the wedding scheduled on April 7 in wake of the government order. Reason: the bride’s home is in the Doda district.